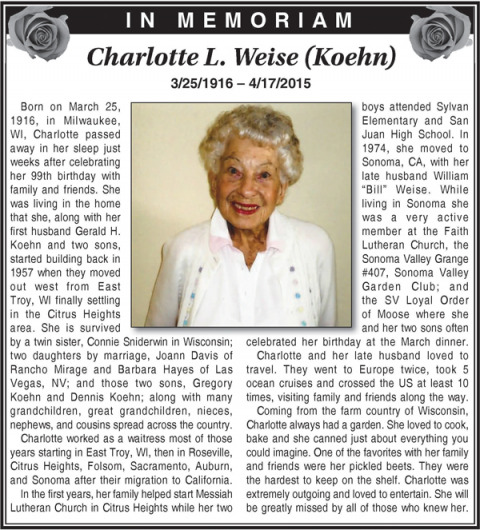 Born on March 25, 1916, in Milwaukee, WI, Charlotte passed away in her sleep just weeks after celebrating her 99th birthday with family and friends. She was living in the home that she, along with her first husband Gerald H. Koehn and two sons, started building back in 1957 when they moved out west from East Troy, WI finally settling in the Citrus Heights area. She is survived by a twin sister, Connie Sniderwin in Wisconsin; two daughters by marriage, Joann Davis of Rancho Mirage and Barbara Hayes of Las Vegas, NV; and those two sons, Gregory Koehn and Dennis Koehn; along with many grandchildren, great grandchildren, nieces, nephews, and cousins spread across the country. Charlotte worked as a waitress most of those years starting in East Troy, WI, then in Roseville, Citrus Heights, Folsom, Sacramento, Auburn, and Sonoma after their migration to California. In the first years, her family helped start Messiah Lutheran Church in Citrus Heights while her two boys attended Sylvan Elementary and San Juan High School. In 1974, she moved to Sonoma, CA, with her late husband William “Bill” Weise. While living in Sonoma she was a very active member at the Faith Lutheran Church, the Sonoma Valley Grange #407, Sonoma Valley Garden Club; and the SV Loyal Order of Moose where she and her two sons often celebrated her birthday at the March dinner. Charlotte and her late husband loved to travel. They went to Europe twice, took 5 ocean cruises and crossed the US at least 10 times, visiting family and friends along the way. Coming from the farm country of Wisconsin, Charlotte always had a garden. She loved to cook, bake and she canned just about everything you could imagine. One of the favorites with her family and friends were her pickled beets. They were the hardest to keep on the shelf. Charlotte was extremely outgoing and loved to entertain. She will be greatly missed by all of those who knew her.